A year after the Jean Nouvel–designed Louvre Abu Dhabi opened its doors in the Saadiyat Island Cultural District, a waterfront arts quarter with buildings from big-name architects, things aren’t entirely rosy. The Austrian steel engineering conglomerate Waagner-Biro, responsible for building the intricately latticed, double-layered dome over the museum, has reportedly declared insolvency due to their involvement in the project. Late payments and inflated costs on the approximately $90 million Louvre offshoot have forced Waagner-Biro to sell its subsidiaries in hope of remaining solvent. The 262-foot-wide dome is made up of almost 8,000 interlocking metal octagons, layered over each other in reference to the mashrabiya, a traditional Islamic sunscreen that shades while allowing air to pass through. The museum below the dome is a loose-knit collection of 23 gallery spaces that together form a layout closer to an open-air market typology than a traditional museum space. Nouvel has described the dome as “an oasis of light”—during the day, the sun filters in from above like starlight, and at night, the museum below causes the roof to glow from within. Waagner-Biro began in 1854 as a locksmith but has grown into a major player in architectural steel installation; the company constructed the spiraling roof of the Great Court in London’s British Museum and the dome of the Reichstag in Berlin. 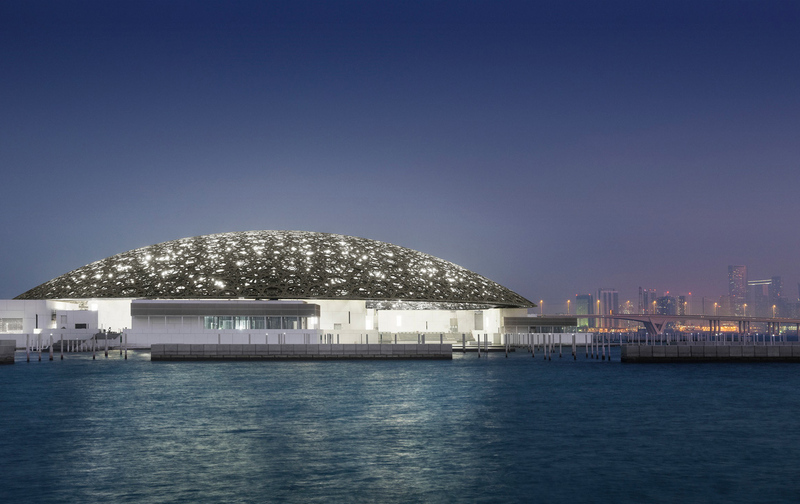 Unfortunately, after costs rose during the Louvre Abu Dhabi dome installation, Abu Dhabi refused to pay and forced Waagner-Biro to shoulder the difference. The firm’s daughter company, SBE Alpha AG, was declared insolvent on October 23 of this year and its financial woes have spread to the rest of the 1,300-employee company. Waagner-Biro has already sold its Waagner-Biro Austria Stage Systems AG subsidiary to Austrian entrepreneur Erhard Grossnigg for restructuring; the offshoot has handled stage engineering work at the Sydney Opera House and Berlin’s State Opera House in the past. While it remains to be seen if Waagner-Biro will be able to emerge from insolvency, that hasn’t been the only piece of bad news for the Louvre Abu Dhabi this week. Salvator Mundi, a portrait of Jesus allegedly painted by Leonardo da Vinci and sold for a record-breaking $450 million last November, has reportedly been feared as lost. Saudi Arabia’s Crown Prince Mohammed bin Salman purchased the painting with the intent of displaying it in the Louvre Abu Dhabi, but the September 18 unveiling date has passed without a peep from the prince. The fate of Salvator Mundi, whether it will be put on display in the new Louvre, or how it’s being cared for are now only known to the Saudi royal family. After more than four years of construction, Jean Nouvel’s Louvre Abu Dhabi will finally open to the public on November 11. Images of the ambitious project, spanned by a 262-foot latticed, double-skinned dome, have been released for the first time ahead of the full opening. Joining Frank Gehry’s troubled Guggenheim Abu Dhabi and museum projects by Zaha Hadid, Tadao Ando and other big name studios, Nouvel’s Louvre is the first completed building on the Saadiyat Island Cultural District. The French architect expressed hope that the museum, sited on the wetland island’s coast, would pay respect to the surrounding environment as well as the cultural history of both France and the United Arab Emirates (UAE). “The Louvre Abu Dhabi becomes the final destination of an urban promenade, a garden on the coast, a cool haven, a shelter of light during the day and evening, its aesthetic consistent with its role as a sanctuary for the most precious works of art,” said Nouvel. Referencing Arab architectural traditions, the project’s radiating dome is composed of nearly 8,000 interlocking metal octagons layered over each other to form a perforated shading system. Shading visitors during the day and shining from below at night, Nouvel called the roof “an oasis of light.” Protected from the elements, the public spaces below will host a rotating selection of pieces specifically commissioned for the museum. Layering patterned partitions is nothing new for Nouvel, whose Burj Doha in Qatar similarly took advantage of the mashrabiya, an Islamic screen designed to keep occupants cool during the summer months. The galleries themselves are a collection of squat, white cubic volumes with ceiling heights that vary from room to room and an irregularly-spaced paneling design that permeates inside to the display areas. This “museum city” totals 23 gallery spaces across 6,400 square meters (21,000 square feet), as well as a children’s museum, auditorium, restaurant and merchandise shops. The floor tiling calls back to Ottoman-era mosaic design, including a “stone carpet” in one of the gallery spaces. The museum's first exhibition, From One Louvre to Another: Opening a Museum for Everyone, will open on December 21st and display 18th century artwork from the opening of the original Musée du Louvre in Paris alongside modern pieces. Brazilian artist Ernesto Neto has been exhibiting his work for almost 25 years. With his latest work, Neto crocheted a netted pavilion shaped almost like a spider that is currently on view at the Sharjah Biennial 11 in the United Arab Emirates. The Biennial, titled Re:emerge, Towards a New Cultural Cartography and curated by Yuko Hasegawa, investigates the overlapping public and private life found in the historic Islamic architecture of the Sharjah courtyards. 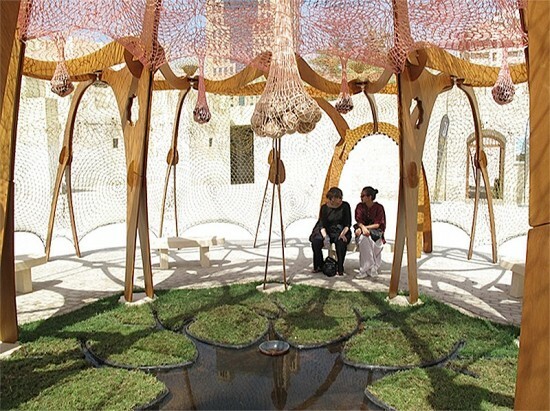 Neto's pavilion, While culture moves us apart, nature brings us together, delineates a calm retreat complete with traditional trademarks of Islamic courtyards including shade, benches, greenery, and a small pond. He used a natural wood frame draped in yellow and pink netting to create a unique circular shape defined by arcs. And while the space looks distinct, it mirrors the basic ideas of traditional Islamic courtyards by offering an intimate public space for diversity, creativity, and exchange. Artists for the Biennial were chosen based on their deep and visible connections with their own cultures, like Neto, in efforts to view places outside their own cultures in fresh ways offering new perspectives and possibly creating cross-cultural materials. New Galleries of the Art of the Arab Lands, Turkey, Iran, Central Asia, and Later South Asia The Metropolitan Museum of Art Permanent galleries opened November 1 After a hiatus of nearly eight years, the Metropolitan Museum’s Department of Islamic Art and its extensive collection—one of the most comprehensive gatherings of this material in the world—will permanently return to view this November in a completely renovated space of fifteen galleries. 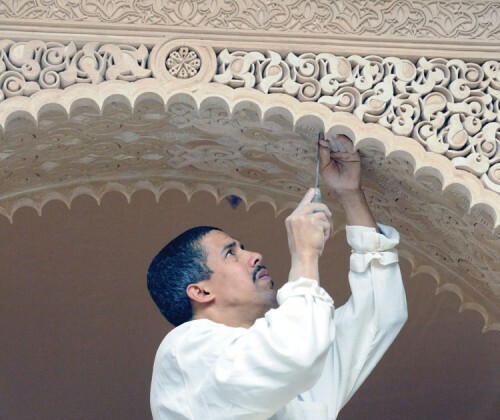 The suite of galleries was constructed by a fleet of Moroccan craftsmen (in action above) recruited specifically for their experience and the precision of their work. Nearly as impressive as the handiwork of different trades is the team of planners, architects, and scholars who collaborated with them. Nadia Erzini, Achva Benzinberg Stein, and other experts worked with Metropolitan’s own curators to create spaces of contextual authenticity. The galleries are arranged geographically, further highlighting the rich and complex diversity of the Islamic world and its distinct cultures within.